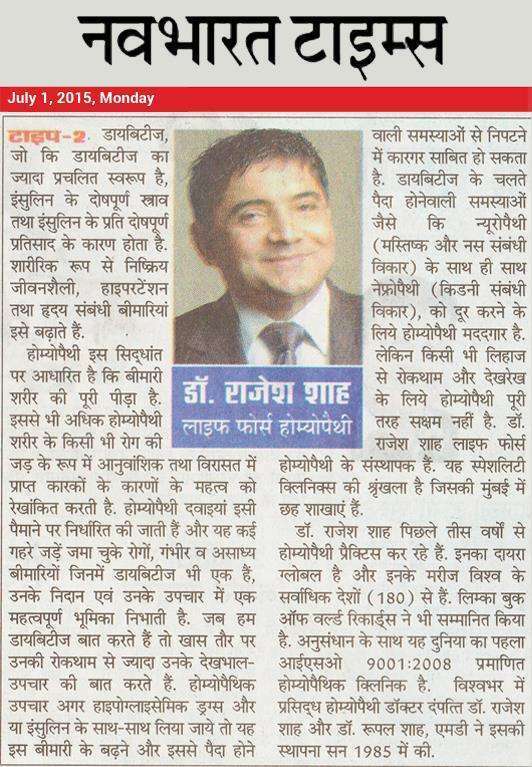 Dr Rajesh Shah, MD, is a homeopathy activist, always wanted to use media to reach out to the world with the message of homeopathy, ever since he was a student at a medical college in the early eighties. Being the pioneer of the Online Medical Practice, he used all possible tools and technology, including video conference and e-commerce, in those years. "Reaching out to the patients across the borders is a huge experience for any doctor," said Dr Shah in an interview, "and that too, to be able to contribute significantly in lives to thousands of patients in all the continents turned out to be a lifetime achievement for me." Online connectivity with thousands of patients across the world has brought in heavy-duty responsibility on Dr Shah and his team at Life Force, as the patients approached for the treatment of difficult diseases and not for regular diseases. "This made me develop a research wing in the clinic set up in the year 1998, where I started working on new drugs for the treatment of chronic diseases, as the regular homeopathic medicines were less effective for many patients," he said. Research became the strength of Dr Shah's homeopathic practice at Life Force, as all the patients were offered the benefits of the new drug discovery and development, which elevated the level of homeopathic services above regular clinics.